These candles can either be burned (follow our burning instructions if you want to preserve the beauty of our candles for years to come), or they can be pre-drilled at your request to accommodate an LED for convenience. They come in different sizes and shapes, see each product page for a more complete description regarding size and design. We are proud of our original designs that you will not find anywhere else!! 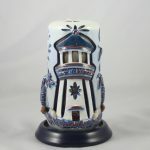 Our Lighthouse Candle has been a very popular addition to our candle line. The tall lighthouse has windows that are illuminated by the candles flame. Flanking the lighthouse are seagulls, a pelican and the sun shining through from above. Make Size and Pre-Drilled Well choices before viewing colors. 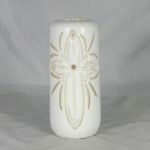 The Cross Candle has an ornate cross on one side only. It comes in one size - approximately 8" in height. When lit or illuminated with an LED, the cross is radiant. Make Pre-Drilled Well choice before viewing colors.